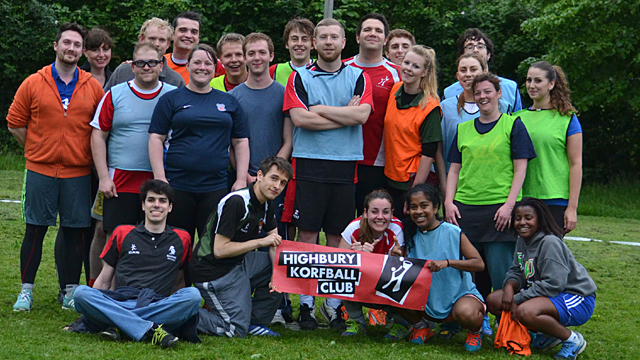 Highbury Korfball Club is extending its free korfball in Finsbury Park into August following the success of the sessions in attracting new players to the sport. After six weeks of playing the north London park 55 people have attended, including 12 who had never previously played korfball. There will now be sessions every Wednesday at 7pm until 10 August. The format of the sessions is simple, everyone is put into mixed teams of four (two men & two women on each team) to play quick fire 4-on-4 matches in a round-robin tournament, making it really accessible to players of all experience. The sessions are followed by a trip to The Finsbury pub, known for its excellent pizzas. Newcomers and beginners are very welcome to the sessions – this is the perfect time to get into korfball in London! New players have attended every week, with the majority coming to multiple sessions. New players can drop the club an email for more details or just show up. You can find the session near the Manor House station entrance to Finsbury Park. Following the Finsbury Park korfball Highbury will also be holding special sessions with top guest coaches on Wednesdays 17, 24 and 31 August at Petchey Academy, Dalston.